So Crisis had found CCRG in Athens and she tried out and made the team. Since then I don’t think I have ever regretted that she didn’t play rugby. As a murder baby she broke her collarbone (which I believe Ozzy Kamazkazi had something to do with), just as she was clearing all of the check off items to pass level three assessments. I was a little concerned at that point in her chosen hobby, which of course I later learned was not just a hobby but a way of life. She and I had some frank discussion at that point that I thought maybe she should quit derby and concentrate on school. But you know, at that time she was carrying over a 3.9 GPA and despite the fact I told her she didn’t need to get a job–that I would give her an allowance while she was in school, she had gotten a part-time job anyway to cover her Derby expenses. Now that I’ve learned what a phenomenal impact the derby community can make on a young woman’s life, I’m really glad that she healed up and went back to derby. So I became a huge fan of CCRG. I still think one of my favorite derby memories was back in July 2013, there was a little over 2 minutes left and CCRG was losing to Dub city 125 to 151. Crisis went on a tear with a 25 point jam to bring CCRG with in 1 point of Dub city. CCRG ended up losing an extremely close bout 154 to 156, but I will never forget standing in the Classic Arena with a sold out crowd of about 700 people chanting “Crisis, Crisis”. That was when I got used to waiting 20 or 30 minutes after a bout was over to speak to my own daughter. But as she became a favorite with the young Athens fans, it was worth it, along with that trademark huge grin that she developed as she skated out into turn 3 after breaking out of the pack. Soon had her dad sporting her trademark lightning bolt to bouts. We all started laughing, and I said “We could call ourselves the Bruise Brothers.” We all went out the next week hunting for matching fedoras and that is how the “Papa Crisis Suit” was born. 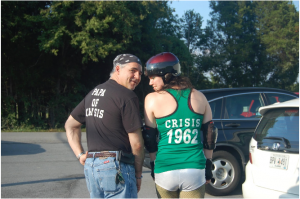 So eventually Crisis graduated from UGA and moved back to Atlanta, transferring to the Atlanta Rollergirls. I remember telling her that she would always be my favorite skater, and that I was sorry, but CCRG would always be my favorite derby team. I continued watching Crisis skate whenever she was rostered, but continued also sporting the Papa Crisis Suit and showing up at the CCRG bouts. 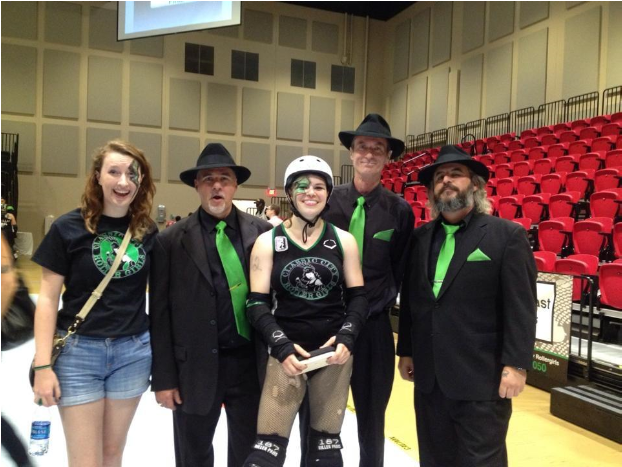 I started NSOing and even had the incredible privilege to be asked to bench coach the Green team in CCRG’s annual Green and Black bout. During all this derby stuff I managed to attend Kennesaw State where I finally graduated with dual masters degrees. While attending some people at work, half-way gassed me up, halfway dared me and I ended up playing Collegian Club level football for KSU. 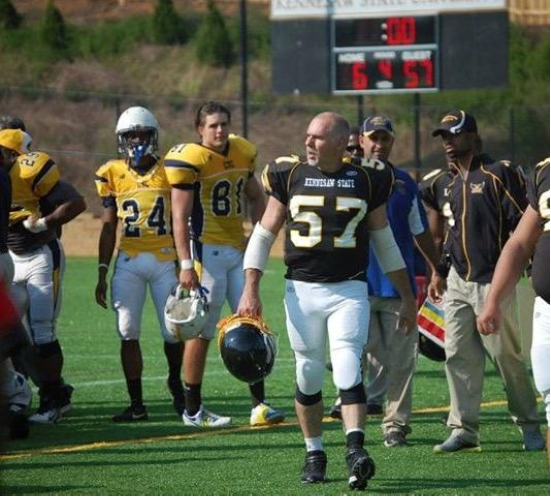 Yes, I was the 52 year old man in full football pads on the field with the 20 year olds. Look, let’s be honest, I was the worst player on the team. My original objective had just been to try out and it not be a joke. And when they gave me my pads and I went through the process to get ready to play, getting checked out by the team trainer, taking the concession test (so if I got one there would be a baseline of how smart I use to be) there were a lot of strange looks. But then I went to my first practice, checked in with the coach, and spent 2 hours giving it everything I had. They had me play defensive end and then ran the ball at me (LOL). At the end of practice, the coach called me over and said “I’m going to be honest, when you walked on the field I didn’t think there was any F*&%ng Way, but you should keep those pads and come back tomorrow.” I never missed a practice after that for 2 years. I was happy just going to train, but they dressed me out for games and I usually got a few snaps every game. As I have always been one to overextend myself and be involved in lots of interesting things, I thought eventually I might like to Coach Derby. After thinking about it, I felt like to be a good derby coach you have to do two things: you have to be able to skate and you have to know the rules just as well as the Refs know them. This discussion with Crisis immediately ended up with her going on one of her extremely animated rants (which I am sure any of you who have skated with her are familiar with) that centered around me learning to skate. That is how I met Wild Cherri and Skully and ended up at Powerhouse skates. The next thing I knew, I was the proud new owner of a pair of Antik Spyders and everything I needed to show up at a CCRG bootcamp for new skaters. Having already been an official derby daddy at CCRG, even after Crisis had moved to a new team, I got so much encouragement from all the ladies at CCRG. I think anyone who had ever thought of how cool it might be if their dad skated seemed to take a personal interest in pushing me as hard as they could. And I had passed level 1 assessments in no time. Katillac Coupe DeVill, Coach Hogan, Inspector, AmityVille, Killabrew, and many of the refs, and all the May Murder babies (M&Ms we know who we are), were so encouraging and helped me so much. 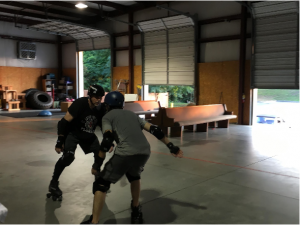 I became a religious attendee of the Saturday morning new skater practice in Athens, as well as skating a few times a week on my own. One of the drawbacks to playing even the absolutely lowest level of college football at 52 is that a very excitable daughter will immediately draw the correlation that there is no excuse why you shouldn’t be able to play derby at 55. As I got better on my skates, I was constantly reminded that I could skate with the men at ARMD. I meet Pittsy, Sakemon and Gooch at a CCRG bout. I thought they were totally awesome guys and the next thing I knew I was regular at ARMD practice and they were calling me one of their “dirt birds”. Since I have started skating with them, I have received so much help from great men skaters like Jazzy, Hung, Gooch, Trash; and many of the ladies of ARG who help coach the men, like The Ruffian, Surfer Rosa, Nora Gretz. 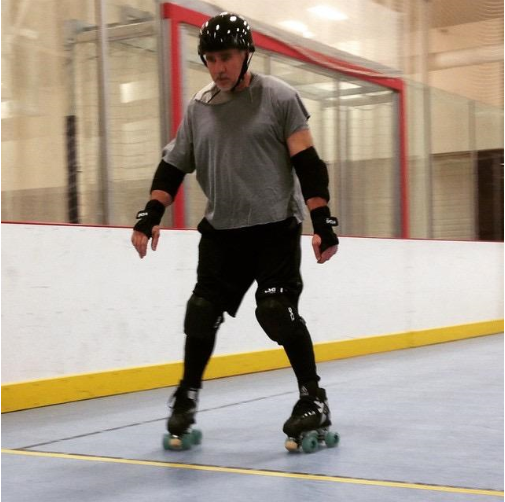 CCRG and Atlanta aren’t the only leagues that have welcomed Crisis’s dad and helped him on his skating journey, though. Sakemon took me to a Thursday night open practice with the Marietta Derby Darlins,’ and I have become a regular there, as well. Coach Jim is usually there and he helped me tremendously. Crisis, I’m sure, has been telling everyone that because I played football a few years ago that I’m going to bout eventually. So I think a lot of the work the men have done with me is because, in addition to being Crisis’s Dad, and they want me to bout in Purple. But the Marietta girls have surprised me with how welcoming and encouraging they are and how quickly they identified me as a Derby Dad and made me feel at home skating with them. So where does Papa Crisis go from here? 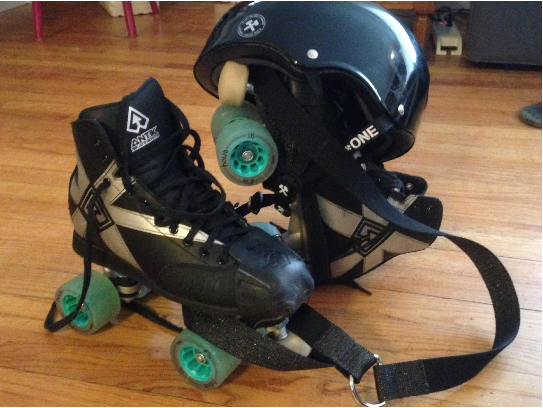 Well, just a few weeks ago I skated 27 laps in 5 minutes at the Marietta assessments, and for Father’s Day I’m getting a new pair of custom Antik skates from Power House, (in purple, gold and Black leather). I am hoping to pass level 2 assessments with CCRG and register my name and number as Papa Crisis (#1961) before the end of summer. Maybe I will become good enough to wear purple in a bout someday–I know I won’t give up trying. I just hope it can be in Athens, that Crisis will be my personal mascot, that Willie T will announce, and that all of the roller girls that have helped me to learn to skate derby will show up and be proud of themselves for being part of the wonderful community that is women’s flat track derby! So if you’re a Derby dad, my coaching to you is that if your daughter is involved in derby, odds are great that it is a large part of her life (there doesn’t seem to be an in-between with derby). So share that with her, get some skates and go to a boot camp, talk to some of the men at AMRD. You don’t have to skate to get involved in someway, volunteer or learn to NSO, or meet some of the people that are a big part of her life. I’m willing to bet that you’ll find out, just like I did, what a great community derby is and you’ll make a bunch of new friends. Leche Gaga–the most AWESOME and bravest, skater/person I know. Gail SkateAnn & Sara Bellum –fellow M&Ms and two of my favorite people to see at practice. Turbo Royale–the Skater that most reminds me of my daughter, same big smile in turn 3 when she breaks out of the pack in the lead, and same intensity. 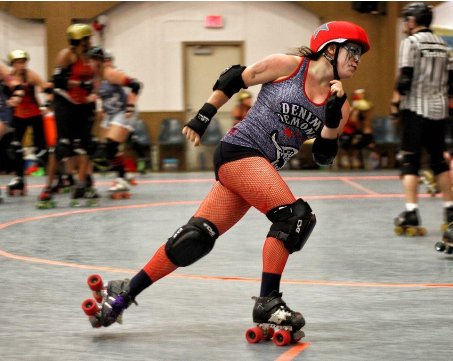 Wild Cherri–absolutely the best skater I have ever seen in a bout, such an all around great person, and gives the best advice. Trog– my favorite Head NSO, super patient, willing to teach you new things. Just don’t let her catch you hugging your favorite skater while you’re in a pink shirt! 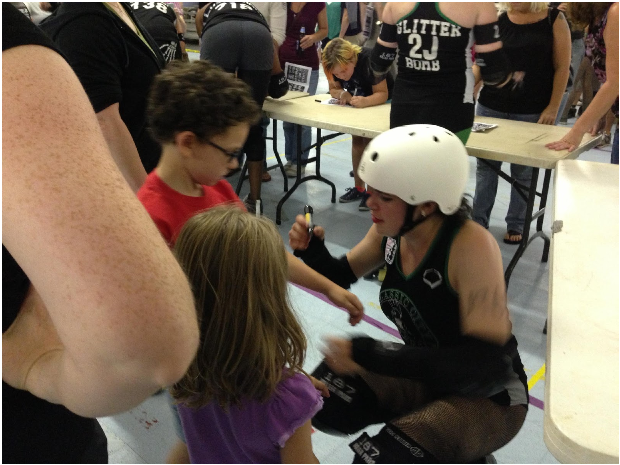 Let’s Roll, Lez Roll – Mavens hit the highway for a Roller Derby Road Trip! 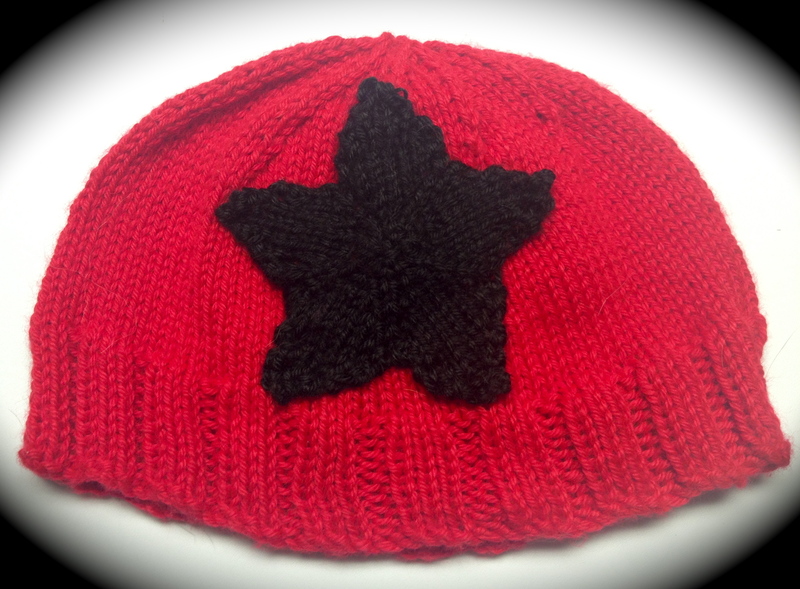 Talk Derby… with Red Devil! Desert Dolls Roller Derby - Season 5 Schedule!